The Advanced Motor Control Pump Controllers are designed to afford the most efficient utilization of your irrigation equipment by protecting the pump against bad usage and ensuring that what little water is available can be used without compromise. # Pressure Limit - Constant Pressure Control compensates for varying flow conditions. # Flow Limit - Adaptive Flow Limit Control limits the flow to prescribed consents. # Suction Pressure - Adaptive Suction control for boost pump applications preventing the pump from cavitation due to excess suction..
Works with any Variable Frequency Drives using Serial Communications (Emotron, Danfoss and Invertek) or 4-20mA and Digital Inputs. Works with Soft Starters using Serial Coms (AuCom EMX3) or digital inputs. 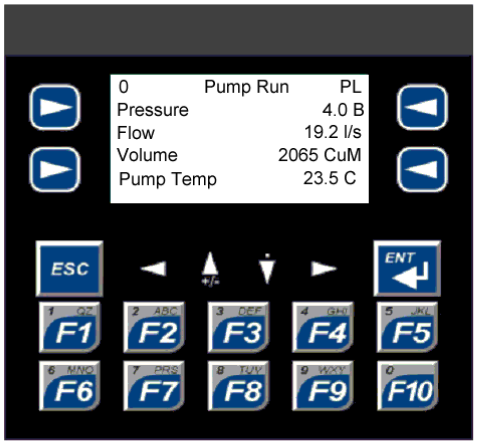 Flow, Level and Volume logging to a uSD card for utility compliance. Time Date Stamped Fault logging. Comprehensive Flow, Pressure and Depth graphing shows trends in usage plus helps in fault diagnosis.